The sites on this loop are situated within Virginia’s southernmost peninsula. 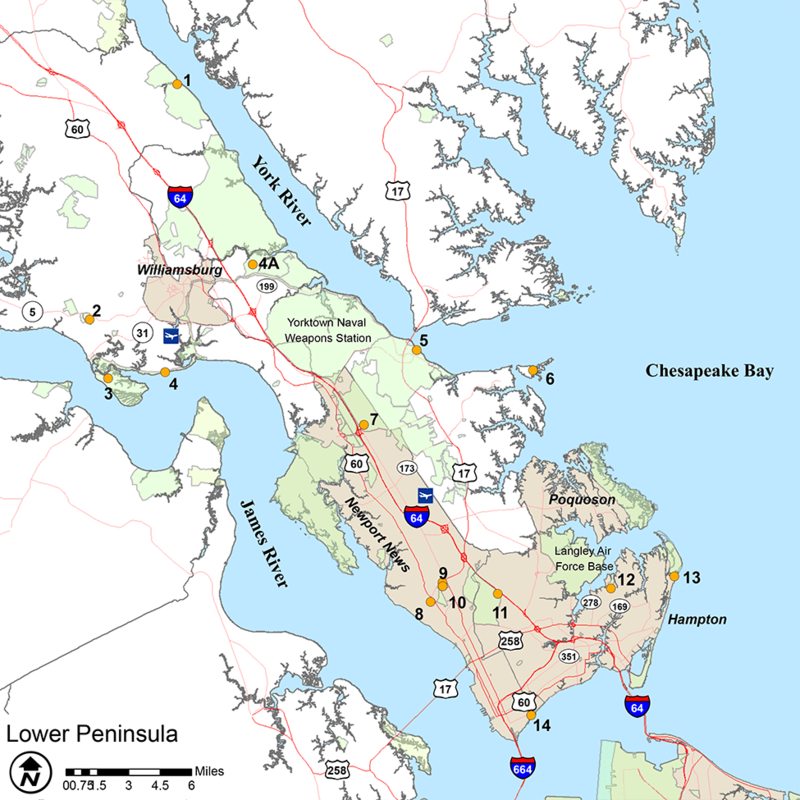 The Peninsula is defined by the York River to the north and the James River to the southwest. At the tip of the peninsula, the waters of the James, Nansemond, and Elizabeth Rivers mix at Hampton Roads, one of the busiest shipping lanes in the world, and the gateway to the Newport News shipbuilding facilities that supply aircraft carriers and destroyers for the world’s most powerful Navy. The loop consists of sites that are both out of the way and nestled among urban areas. We begin the loop near the base of the peninsula at York River State Park, whose diversity of woodland and estuarine habitats has made it a popular venue for wildlife watching. The loop continues south, passing through some of the most significant sites in the struggle for American independence: Jamestown, an early colonial settlement, Yorktown Battlefield, site of the last major battle fought in the American Revolution, and Colonial Williamsburg. Travelers staying in Williamsburg, Yorktown, Newport News, or Hampton may easily reach the sites on this loop.